Sorry for being silent for the past several days. Nothing exciting to report, just life. Regular life stuff. Thank you all for commenting about stabilizing the front button band. I will try option 1 and sew grosgrain ribbon behind the buttons hoping that will solve the uncomfortable feeling like it’s gaping open. As usual, I don’t have the right ribbon in my sewing room so I’ll have to buy some either today or tomorrow. 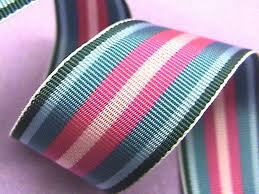 This striped ribbon would be nice but I won’t find anything like this where I live. I’ve already looked. We’ve been invited to a retirement dinner Friday evening for six, count ’em SIX, of Mr. Aitch’s former co-workers that are retiring this year. That’s a lot of teachers for a small school. I have to hem a new pair of Mr. Aitch’s pants before then and I want to wear my Peony Twist Cardi so sewing the ribbon on is vital if I wear the sweater. I may have to come up with Plan B if I don’t get the ribbon sewn on. Mr. Aitch’s pants come first…this time. He doesn’t have a Plan B. Even if you don’t find any ribbon, your sweater will be a hit anyway. Probably everyone will be looking at the retirees to see what they wear and how they act. Definitely pants come first.